The 2009 Australian Koala Silver Coin marks the third issue of this popular series. The coins are struck in four sizes - 1 kilo, 10 oz, 1 oz, and 1/2 oz, with the 1 kilo size bearing a slightly different design. These collectible coins are struck on a mint to order basis, and total production determined when the 2010 design is announced, thus closing the 2009 offering. The koala, native to Australia, is practically an icon synonymous with the country. Probably the only other animal to claim the same distinction would be the kangaroo, a fellow marsupial.. Living almost entirely on a diet of eucalypt leaves, the koala's habitat is restricted to areas of Australia capable of growing the trees. Koalas were hunted almost to extinction in the early 20th century for their fur, but their numbers have grown steadily under the protection of the government. The coins will ship on an illustrated display card, which will include a Certificate of Authenticity on the back. Some key points advertised for the coins include their government assurance of weight and purity, their Australian legal tender status, limited mintages, versatile sizes and new annual reverse designs. The obverse contains an image of Queen Elizabeth II along with the inscriptions "Queen Elizabeth II", "Australia", "2009" and "1 Dollar" ( "1 Dollar" changes based on the size). Two slightly different designs grace the reverse of the 2009 Koala bullion silver coin, depending on its size. The reverses the 10 oz, 1 oz, and 1/2 oz sizes have an image of a young koala sitting on a tree branch, in front of a unique shimmering background. The 1 kilo size does not have a shimmering background. 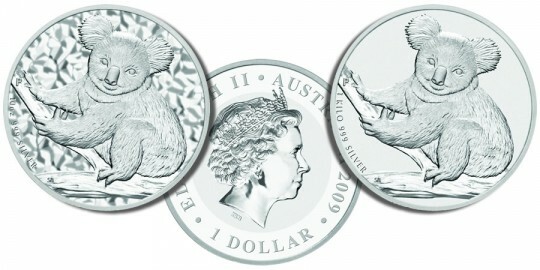 Update: The Perth Mint has now issued the 2010 Australian Koala Silver Coin.